There is nothing quite so rewarding as crafting something homemade to give as a gift or keep for yourself. Handmade crochet dolls are the perfect gift for that child or doll collector in your life. 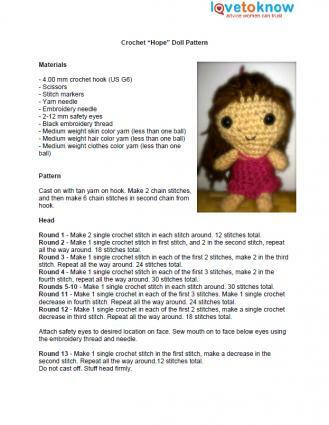 Crochet doll patterns vary widely in style and complexity, so be sure to choose a pattern that best suits your crocheting ability for best results. Every little girl dreams of being a princess. This lovely princess crocheted doll is sure to be a hit. Cast on with hair color yarn and make a 6 chain loop. Round 1 - Make 2 single crochet in each stitch around. 12 stitches total. Round 2 - Make 1 single crochet in first stitch, and 2 single crochet in next, repeat around. 18 stitches total. Round 3 - Make 1 single crochet in first two stitches, and 2 single crochet in next, repeat around. 24 stitches total. Round 4 - Make 1 single crochet in first three stitches, and 2 single crochet in next, repeat around. 30 stitches total. Rounds 5-10 - Make 1 single crochet stitch in each stitch around. 30 stitches total. Round 11 - Make 1 single crochet in each of the first 3 stitches. Make 1 single crochet decrease in fourth stitch. Repeat all the way around. 24 stitches total. Round 12 - Make 1 single crochet in each of the first 2 stitches, make a single crochet decrease in third stitch. Repeat all the way around. 18 stitches total. Attach safety eyes to desired location on face. Sew mouth on to face below eyes using the embroidery thread and needle. Round 13 - Make 1 single crochet stitch in the first stitch, make a decrease in the second stitch. Repeat all the way around.12 stitches total. Do not cast off. Stuff head firmly. Rounds 1-6 - Make one single crochet stitch in each stitch around. 12 stitches total. Round 7 - Make a decrease in each stitch around. 6 stitches total. Cast off. At this point your doll should look like a light bulb but don't worry, it will look normal after you add the arms and legs. Cast on with skin color yarn. Make a 6-chain stitch loop. Rounds 1-6 - 1 single crochet in each stitch around. 6 stitches total. Cast off, leave tail for sewing. Rounds 1-3 - 1 single crochet in each stitch around. 6 stitches total. Make a bun for the princess' hair. Cast on with hair color yarn and make a 6-chain loop. Round 1 - Make 2 single crochet stitches in each stitch around. 12 stitches total. Rounds 2-4 - Single crochet in each stitch around. 12 stitches total. Cast off, leave tail for sewing. Sew bun to top and center of the head. Cut two small pieces of hair color yarn and tie them to the doll's head on either side of her face. Fray the yarn to make it look more hair-like. With flower color yarn cast on and make a 16-chain loop. Rounds 1-3 - Make 1 single crochet stitch in each stitch around. 16 stitches total. Round 4 - In first stitch make 1 single crochet, 1 half-double crochet, 1 double crochet, 1 half double crochet, 1 single crochet stitch. Repeat in each stitch around to make petals for the flower dress. Attach green yarn. 16 petals total. Round 5 - Single crochet in first stitch and make 8 chain stitches. Skip to top of next petal and make a single crochet stitch. Repeat all the way around to make green loops. 16 loops total. Put dress on doll. Tie yarn on front of dress and tie around doll's neck to make a dress strap. Cast on with flower color yarn and make a 14-chain loop. Round 1 - Single crochet in first stitch. In next stitch make 1 single crochet stitch, 1 half-double crochet stitch, 1 double crochet stitch, 1 half double crochet stitch, 1 single crochet stitch. This will make a petal. Repeat all the way around to make 6 petals total. Cast off. Make a leaf with green yarn using the same method as the petals, cast on and chain 2. Round 1 - 1 double crochet, 1 half double crochet, 1 single crochet, 1 half double crochet, and one double crochet in second chain from hook. Cast off, leave long tail for sewing. Sew leaf to side of flower. Slip flower over doll's bun to make crown. This adorable little doll looks like the girl next door. She sparkles with personality. Cast on with tan yarn on hook. Make 2 chain stitches, and then make 6 chain stitches in second chain from hook. Round 2 - Make 1 single crochet stitch in first stitch, and 2 in the second stitch, repeat all the way around. 18 stitches total. Round 3 - Make 1 single crochet stitch in each of the first 2 stitches, make 2 in the third stitch. Repeat all the way around. 24 stitches total. Round 4 - Make 1 single crochet stitch in each of the first 3 stitches, make 2 in the fourth stitch, repeat all the way around. 30 stitches total. Round 11 - Make 1 single crochet in each of the first 3 stitches. Make 1 single crochet decrease in fourth stitch. Repeat all the way around. 24 stitches total. Round 12 - Make 1 single crochet in each of the first 2 stitches, make a single crochet decrease in third stitch. Repeat all the way around. 18 stitches total. Round 1-6 - Make one single crochet stitch in each stitch around. 12 stitches total. Stuff body. Round 7 - Make a decrease in each stitch around. 6 stitches total. Cast off. At this point your doll should look like a light bulb, but don't worry it will look normal after you add the arms and legs. Rounds 1-6 - 1 single crochet in each stitch around. 6 stitches total. Cast off and leave tail for sewing. Coast on with skin color yarn. Make a 6-chain stitch loop. Rounds 1-3 - 1 single crochet in each stitch around. 6 stitches total. Cast off, leave tail for sewing. Cut a handful of yarn in the hair color of your choice, each piece measuring 8 inches long. Loop one piece of yarn, pull through stitch in top of head, grab pieces of the same yarn with hook and pull through. Repeat until the head is covered. Cut, style, or braid the hair however you would like. Cast on with clothes color yarn and make a 16 chain loop. Rounds 1-3 - Make one single crochet in each stitch. 16 stitches total. Round 4 - Make 1 single crochet stitch in first stitch, make 3 half double crochet stitches in next. Repeat all the way around. Cast off. Tie clothes color yarn around arms for dress straps. Tie more yarn in hair as hair ties or headbands. There is no shortage of free online patterns to choose from. No matter who you are making your crocheted doll for, you are sure to find something for everyone on these sites. Be sure to read patterns carefully and make sure that you understand all the directions before beginning. Crocheted bunting doll is an adorable project. This pattern comes in three sizes and is very Waldorf in style. Basic stitches make it a great project for novice stitchers. This Raggedy Anne doll is just as cute as the original. If you have a little boy in the family that loves the ocean, make him this Sailor Crocheted doll. He is just the companion for nautical play. Victorian lady is demure and beautiful in her lace embellished gown. Mrs. Claus is a cheery holiday project. Great take along toys, these crocheted mermaids will surely star in many imaginative situations. This larger mermaid is a beautiful and colorful project. Tiny Red Riding Hood and Grandmother topsy turvy doll is small enough to be a quick project. Several patterns for topsy turvy dolls from literature make thoughtful gifts that encourage interactive play. 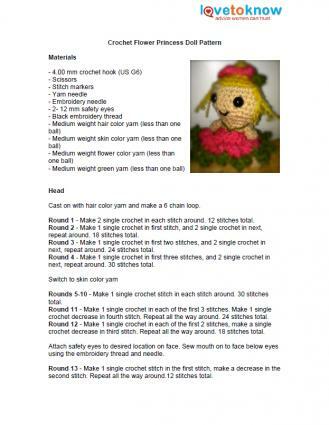 By using different patterns and varying the colors of yarn, you can make a huge variety of crocheted dolls and accessories. For very young children, make projects that do not have buttons and other items that may come off in a baby's mouth. If you enjoy making these wonderful dolls, you may eventually run out of family members to give them to. Consider making them for children's hospitals, police stations, and homeless shelters. These organizations often deal with children that are experiencing traumatic situations. The toys that crafters donate can make a big difference in a child's life.